Torchwood is a British science fiction television programme created by Russell T Davies. The series is a spin-off from the 2005 revival of the long-running science fiction programme Doctor Who. The show has shifted its broadcast channel each series to reflect its growing audience, moving from BBC Three to BBC Two to BBC One, and acquiring U.S. financing in its fourth series when it became a co-production of BBC One and Starz. In contrast to Doctor Who, whose target audience includes both adults and children, Torchwood is aimed at an older audience. Torchwood follows the exploits of a small team of alien-hunters, who make up the Cardiff, Wales branch of the fictional Torchwood Institute, which deals mainly with incidents involving extraterrestrials. Its central character is Captain Jack Harkness (John Barrowman), an immortal former con-man from the distant future; Jack originally appeared in the 2005 series of Doctor Who. 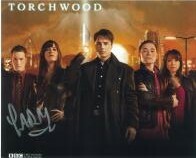 Other than Barrowman, the initial main cast of the series consisted of Eve Myles, Burn Gorman, Naoko Mori and Gareth David-Lloyd. Their characters are specialists for the Torchwood team, often tracking down aliens and defending the planet from alien and nefarious human threats. In its first two series, the show uses a time rift in Cardiff as its primary plot generator, accounting for the unusual preponderance of alien beings in Cardiff. In the third and fourth series, Torchwood operate as fugitives. Gorman and Mori's characters were written out of the story at the end of the second series. Recurring actor Kai Owen was promoted to the main cast in series three, in which David-Lloyd too was written out. Subsequently, American actors Mekhi Phifer, Alexa Havins and Bill Pullman joined the cast of the show for its fourth series; the latter two were written out at the end of its run. The first series premiered on BBC Three and on BBC HD in 2006 to mixed reviews but viewing figures which broke records for the digital channel. It returned in 2008 where it aired first on BBC Two, receiving a higher budget; its uneven tone, a criticism of the first series, was largely smoothed out, and the show attracted higher ratings and better reviews. The third series episodes worked on a bigger budget and transferred to the network's flagship channel, BBC One as a five episode serial, entitled Torchwood: Children of Earth. Despite airing in July evenings, typically a graveyard slot, spread across five nights in one week, the show received unexpectedly high ratings at home and abroad and, for the most part, reviews hailed it as excellent. A fourth series, co-produced by BBC Wales, BBC Worldwide and US premium entertainment network Starz aired in 2011 under the title Torchwood: Miracle Day. Set both in Wales and the United States, Miracle Day fared less well with critics than the previous series, though was applauded by some for its ambition. In October 2012, Davies announced that for personal reasons the show would enter indefinite hiatus.